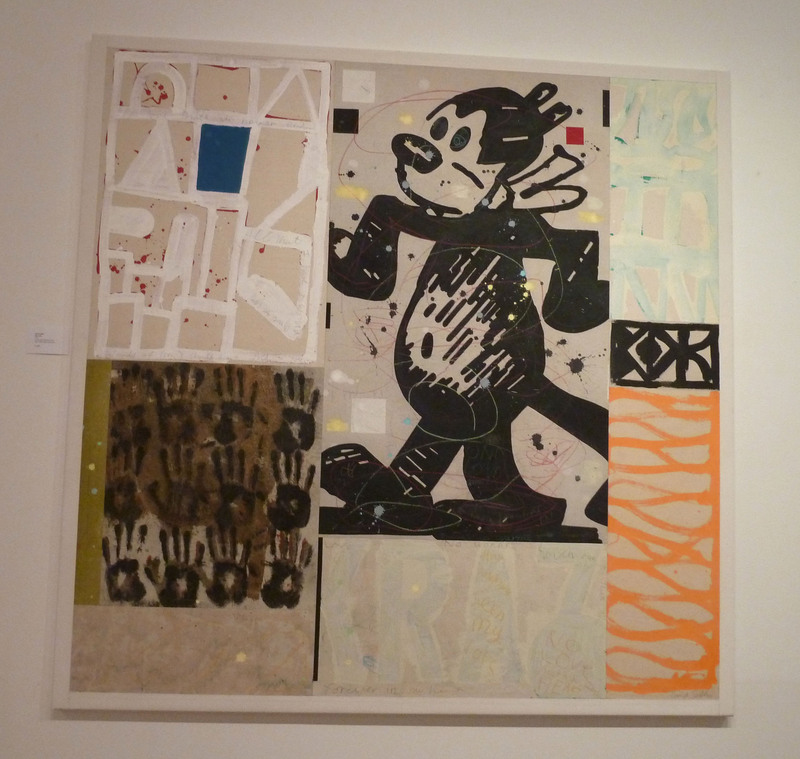 David Spiller’s works always manage to make people smile – playing with images from popular culture such as Popeye and Olive Oyl or Minnie and Mickey Mouse that are often graffitied with his uniquely personal language. The paintings are always filled with joy, vibrancy and passion. They are frequently romantic. There was no information available in the gallery and, when I asked about the exhibition, the gallery attendant wasn’t able to proffer anything except the prices but the website tells us that the show presents 25 new works in which Spiller has, supposedly, started to move away from his trademark style to a more reflective and elusive way of painting. David Spiller at Beaux Arts. Own photograph. Indeed, the paintings have become a bit darker in tone and lost some of their dynamism and energy but it’s not as if Spiller has broken free from the mould. They are fairly good works (if you like Spiller) but what’s great about Spiller is the fun factor and it would be sad if he decides to move away from this. David Spiller, No Words, 2011. Own photograph. 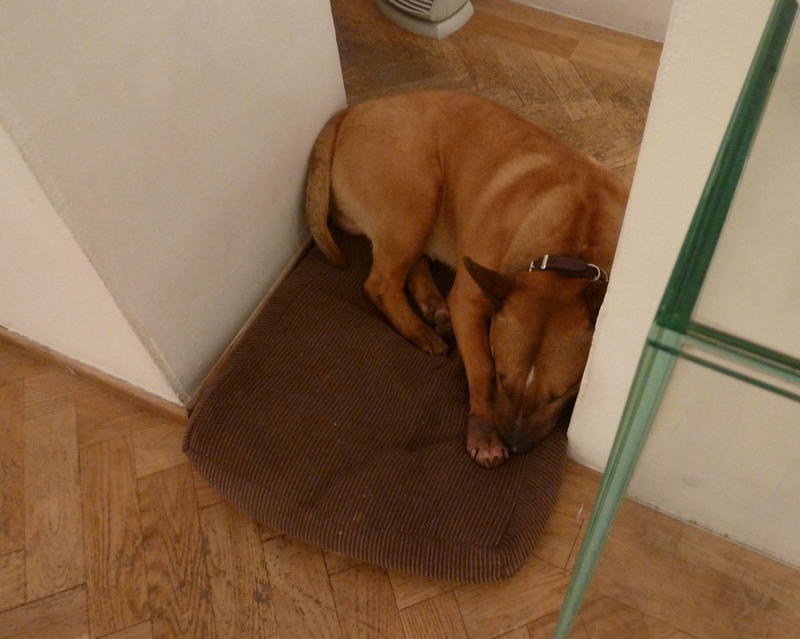 The Beaux Arts’ dog was napping quietly in the gallery which is always a nice reward. Still the only Dog in the Blog. Own photograph. Just down the road from Cork Street, White Cube has mounted another double exhibition – that uses both Mason’s Yard and Hoxton Square – a stunt which seems to be all the range at the moment. One of the original YBAs, Gary Hume’s career took off straight after finishing at Goldmsiths when Saatchi bought two of his paintings and commissioned a further four. He’s always been famous but he’s never had the celebrity profile of some of his peers. But, then again, he’s never been quite as radical. There is the feeling that Hume was in the right place at the right time and benefitted from the go-get-it attitude of some of the others. The ground floor gallery presents a range of paintings of flowers and plants, suggesting innocence and newness. They’re nice, but not exciting. 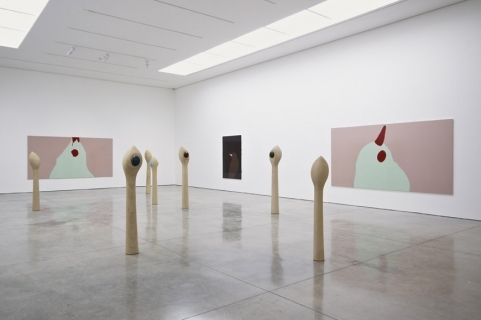 Gary Hume, Ground Floor at Mason’s Yard. Image via www.whitecube.com. 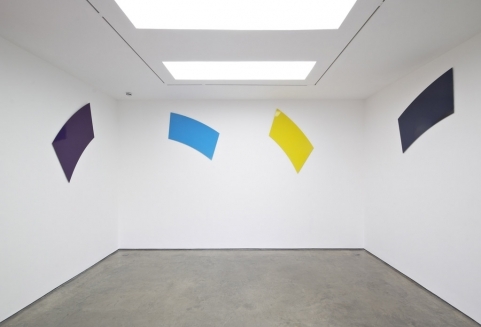 Hume’s works are all about the painted surface as the shimmering quality of his paint takes on a lacquered appearance. His favourite medium, as reflected by this show, is gloss paint on aluminium and he has no plans to change his working style. Although they look like painting-by-numbers canvases, the process is complicated with a system of tracing the image from acetate, transferring it to aluminium when he is finally happy and then building up the lines with draught excluder. Then they are painted and the lines cut away to create sharp edges. He enjoys the reflective nature of this type of paint and how it imposes multiple levels on his work. Gary Hume. Leaves in grey, 2011. Image via www.whitecube.com. His paintings are decorative, making use of pretty colours; they’d be well-suited to an interior designer working with a colour chart. The downstairs works are more interesting but this is partly due to the brighter, better space and the interplay of sculpture and painting. You’d be easily forgiven for not really knowing what these paintings depict. They look like blobs, brightly coloured masses that didn’t demand my time or my attention. A large problem with these works is that they deserve more explanation than we’re given in the gallery. A one-sided press release is on offer to give us some background about the work but, when you skim the surplus, there are only three paragraphs with any substance and they seem to miss the points about which Hume labours when interviewed. 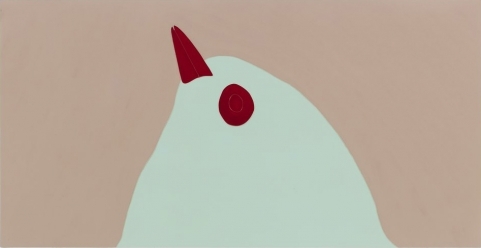 Gary Hume, Paradise Painting Two, 2010. Image via www.whitecube.com. 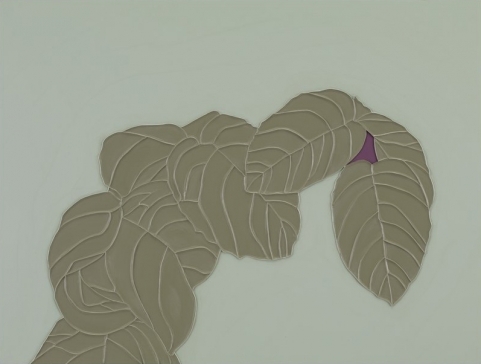 The sculptures downstairs at Mason’s Yard look like giant worms, waiting to be eaten by the birds in the paintings on the walls. But, Hume describes the ‘birds’ as ‘pubescent girls’ shown in some strange sexual paradise. Seen in this context, the sweet worms take on a phallic presence with a more dominating tone. But, this sort of idea doesn’t shock anymore. I don’t think Hume is trying to shock us either. He’s just doing what he knows with a slightly warped sense of humour. Installation shot of downstairs at Mason’s Yard. Image via www.whitecube.com. The Indifferent Owl just isn’t exciting. It’s an in-out exhibition that didn’t really merit the time I had allocated for it. I wasn’t looking forward to heading to Hoxton but felt maybe this would complete the picture for me; I far preferred browsing stock in other Mayfair galleries that I passed. Anyway, off I went on the tube to White Cube part two. The works in Hoxton Square are a bit grittier. The Playground, a large-scale black canvas, really sums up what Hume is trying to achieve through the use of his reflective medium. 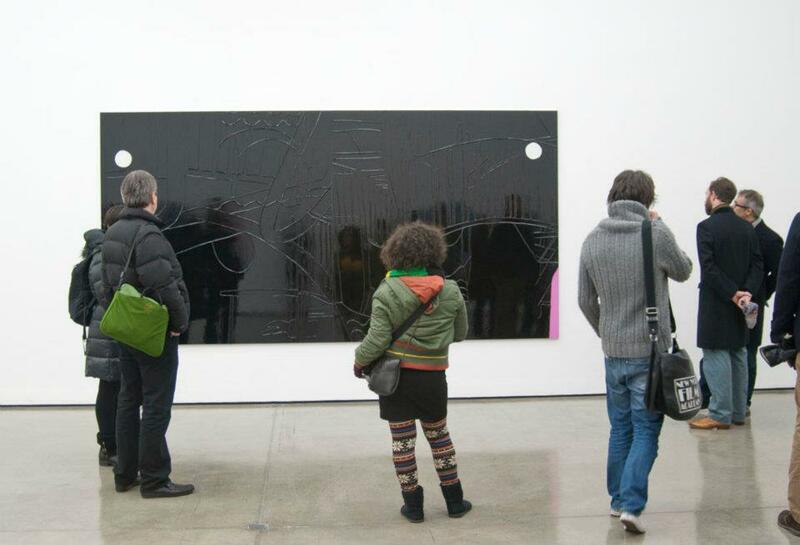 Visitors to White Cube with The Playground in the background. Image via www.facebook.com/whitecubegalleries. Upstairs, Hume has installed a rainbow into the small gallery, aluminium fragments placed high up on the walls. The colours aren’t displayed in the conventional order and the work feels a bit lacklustre. A rainbow is meant to invoke happiness and joy – this just felt a bit bland. I could take it or leave it. There is one great drawing here, though, that seems at odds with the rest of the exhibition and is definitely worth climbing up the stairs to see. Hume’s rainbow. Image via www.whitecube.com. The show’s title, The Indifferent Owl, refers to an epiphany Hume experienced in New York when, one evening, he heard an owl hooting. The next day he found a silver party balloon semi-deflated in the mud and reflected that the owl must have seen it with total indifference. For me, this bears no relation to what’s on show here and is somewhat ridiculous. Hume himself is described as being remarkably dishevelled and generally a bit of a mess which is surprising when looking at the clinical neatness of his paintings. As is so often the case, Hume is another artist whose work doesn’t reproduce well. The paintings are not that much better in the flesh but the boldness and brightness of the colours is, at least, given the opportunity to radiate from the walls. The works are elegant but they don’t take long to admire. Hume himself says he’s only ‘creative for half an hour a day’ using the rest of the time ‘to make that creativity visible.’ Maybe he should try to spend a little longer being creative and then I’d want to spend a little longer in the exhibition. 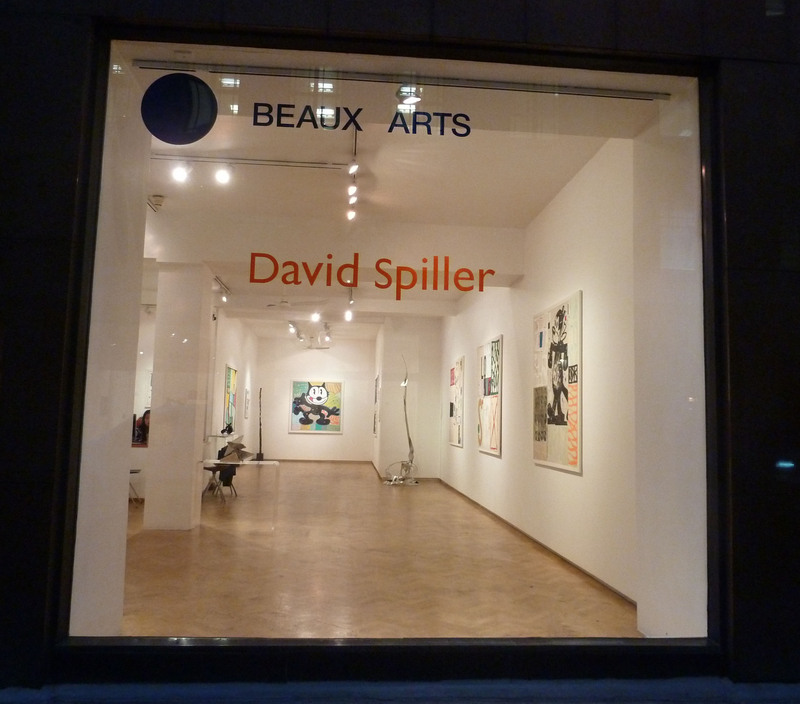 David Spiller is at Beaux Arts until 18th February 2012, www.beauxartslondon.co.uk. 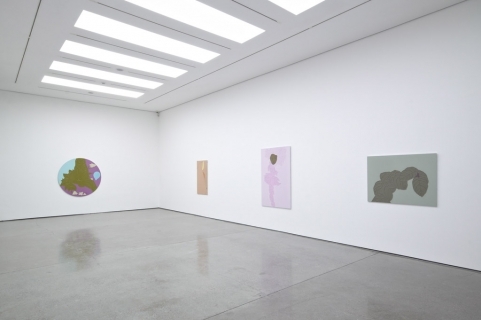 Gary Hume: The Indifferent Owl is at White Cube Hoxton Square and Mason’s Yard until 25th February 2012, www.whitecube.com.